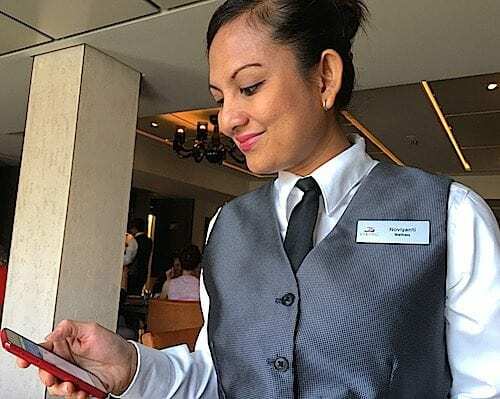 ABOARD THE VIKING SKY – In the often-cutthroat world of business, I just heard the nicest thing on my Viking Sky cruise. The wonderful Manfredi’s Italian restaurant on the ship was named for Silversea’s chairman Manfredi Lefebvre d’Ovidio. In return, d’Ovidio named a special spot on Silversea’s cruise ship after Viking Cruise chairman Torstein Hagen. At the very top of the Silversea’s ship, it’s called Tor’s Observation Library. 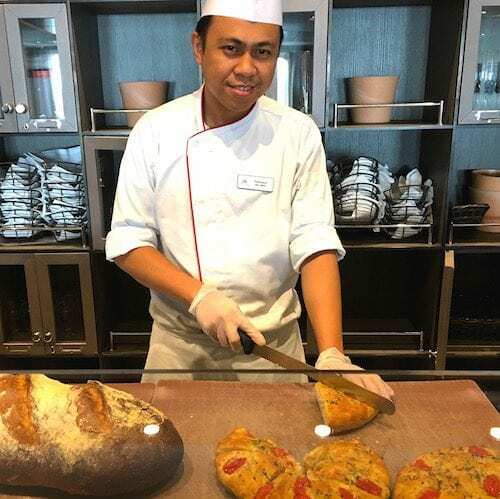 Francisco cuts bread that he has freshly made in the open kitchen. How about that for two competitors who can still be friends while aiming for excellence in the growing cruise world. I’ve never sailed with Silversea but I can tell you from firsthand experience that Manfredi’s is excellent. I’ve dined there twice and hope to get in one more dinner before the cruise ends. 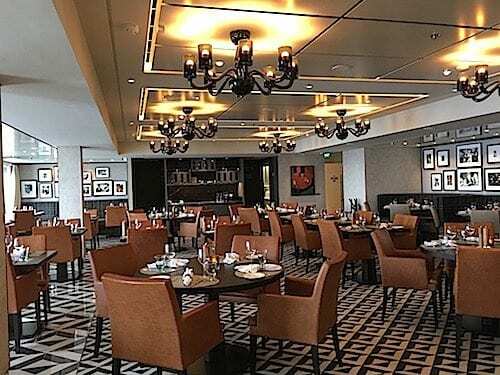 Although Manfredi’s is one of Viking Sky’s specialty restaurants, there is no charge to dine there. Reservations are required and every passenger is guaranteed at least one dinner in Manfredi’s. One of the nice things about Viking Sky is that reservations can be made on my stateroom TV as well as by calling the reservation desk. So, I just click on the TV, see what times are open at Manfredi’s and make a reservation. The TV also lists the menus at each restaurant, including upcoming menus. Quite a handy feature. Unlike the Scandinavia-themed décor on the rest of the ship, Manfredi’s definitely has an Italian vibe. Dark woods, black-and-white floor, booths along one wall, framed photos of Italy’s famous movie stars. 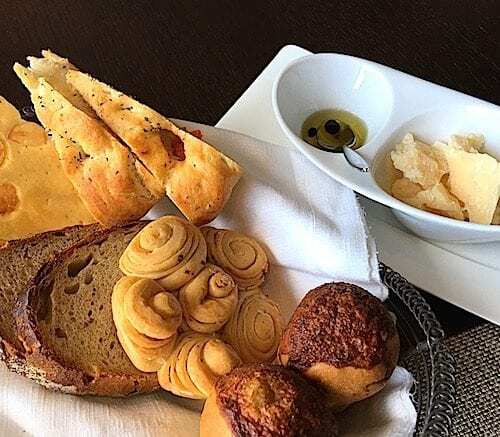 Manfredi’s bread basket for one could be a meal in itself. 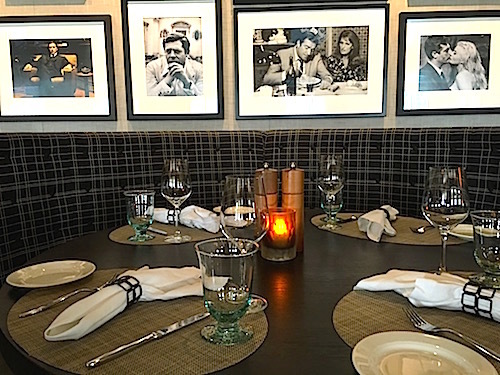 Manfredi’s entryway has a framed screen playing the famous dining clip from the 1963 movie “Tom Jones” where actors Albert Finney and Joyce Redman turn an innocent meal into a hilarious eating binge. The “Tom Jones” clip is obviously being televised but I’ll tell you about an experience I had in the ship’s “Chef’s Table” dining room where there are framed pictures that move. On first glance, they look like beautiful scenic paintings. But they change, almost imperceptibly. Flowers sometimes wave in the wind. A tree slowly loses and regains its red petals. The first time I dined at the Chef’s Table, I overheard the man at the table next to me tell his wife that the paintings on the wall were moving. Of course, she couldn’t see those surprising movements because she was sitting with her back to the unusual photos. Waitress Noviyanti places an order on an electronic device that sends directly to the kitchen. Every time he would tell her to turn around and look, the movement would have stopped. Finally, the man looked at me and asked if I was seeing what he was seeing or if his eyes were playing tricks on him. I told him his eyes were fine. Just another interesting tidbit that Viking has done to entertain passengers. Manfredi’s and the ship’s other restaurants have a modern way to place orders quickly so they can be delivered to diners as soon as possible. The waiters use electronic devices to type in a diner’s order and send it immediately to the kitchen. Saves on paperwork, too, which Viking is intent on doing. Unlike the rest of the Scandinavian-themed ship, Manfredi’s has a definite Italian vibe. Wine, beer and soft drinks are complimentary at lunch and dinner. After just one meal, the waiters knew my name, which drink I preferred and that I liked a table by the window. They also warned me that servings are large which I appreciated knowing. An open kitchen showcases chefs making antipasto and other delicious dishes. I took a photo of baker Francisco creating a fresh-baked bread basket and carving chunks of Parmesan cheese from a big wheel. Many restaurants might bring a basket with a couple of choices of bread. In Manfredi’s, my basket had six different breads along with a bowl of olive oil and big bunch of Parmesan. That was all for one person and could have been a meal in itself. Grilled swordfish topped with sautéed greens was delicious. Viking Sky makes its pasta fresh daily in the kitchen. Both times I’ve dined in Manfredi’s, I’ve ordered a small portion of hand-rolled potato gnocchi with black truffle sauce. I had planned to try a different pasta on my second visit but the gnocchi was too good to pass up. 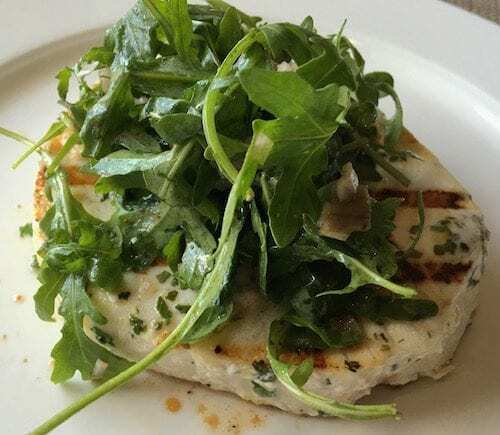 The first time I had marinated and grilled swordfish for my entree. Excellent. Second time was the entrée that most diners rave about – bistecca fiorentina, a ribeye marinated in balsamic vinegar for 72 hours, coated in garlic oil and rubbed with spices before grilling. Definitely worth raving about. The menu also has a wide range of salads and starters, plus pork, veal, ahi tuna, sea bass and other choices. Vegetarians can pick from a nice variety of pastas and risottos. My dessert was so good that I ordered it both nights. For dessert, I have had the same choice both times – Baba al Rum, Fragole e Sorbetto di Lampone e Limone. 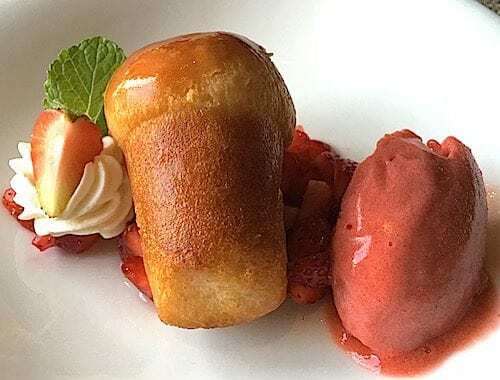 It’s like sponge cake soaked in rum atop a bed of fresh strawberries with whipped cream and strawberry sorbet. It was awesome. If I’m lucky enough to get another Manfredi’s reservation, maybe I’ll try something different. I don’t know Mr. Manfredi but he definitely can be proud of his namesake. Manfredi’s is one of the top restaurants I’ve ever dined in – either on land or on sea.